Katie Afton, left, and Rachael Webb, right, compete at the NCAA Division III Cross Country Championships on Saturday, Nov. 22, in Mason, Ohio. 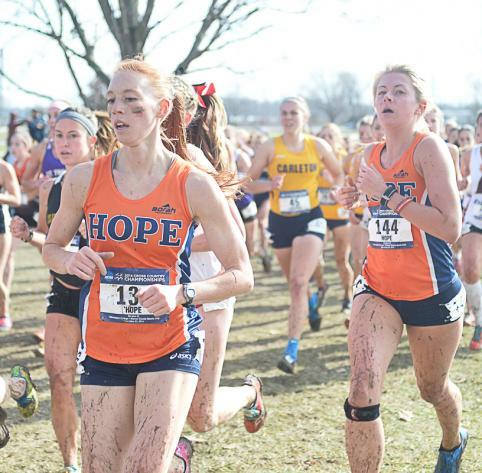 The Hope College women’s cross country team finished 23rd at the 2014 NCAA Division III Championships on Saturday, Nov. 22, in Mason, Ohio. The Flying Dutch scored 591 points in the 32-team field. Junior Julia Stock of Spring Lake, Michigan (Grand Haven HS), led Hope with a 107th-place effort out of 280 runners of 23 minutes, 17.4 seconds. Junior Michelle Kerr of Dearborn, Michigan (Divine Child HS), finished 137th in 23:29.5. Sophomore Emily Joosse of Chillicothe, Ohio (Zane Trace HS), came in 143rd at 23:33.0. Senior Katie Afton of Portage, Michigan (Portage Central HS), placed 188th at 23:50.6. Sophomore Erin Herrman of Wheaton, Illinois (Wheaton-Warrenville South HS), rounded out Hope’s scoring. She placed 207th at 24:04.7. Others to race for Hope were freshman Rachael Webb of Grandville, Michigan (Grandville HS), in 202nd at 24:44.2 and senior Emily Wrozek of Clarklake, Michigan (Hanover-Horton HHS), in 275th at 27:02.1. Johns Hopkins claimed the national title with 87 points. Mark Northuis would not be surprised to see his Hope College women’s cross country team surpass its national ranking this week at the NCAA Division III Championships. Hope College’s Ben Zank is running after All-America honors at the NCAA Division III Men’s Cross Country Championships on Saturday in King Island, Ohio.